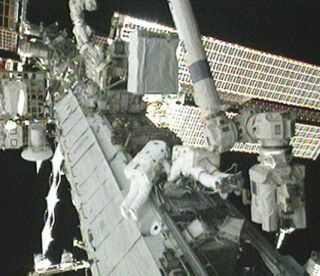 Astronautsliving on the International Space Station said Thursday that their orbiting labis finally back in action after a series of tricky spacewalks to replace abroken coolant pump. Americanastronauts Douglas Wheelock, Tracy Caldwell Dyson and Shannon Walker lauded theefforts of engineers on Earth to help them restorethe station's cooling system to full strength after a vital pump modulefailed July 31. The astronauts performed threechallenging spacewalks this month to make the repairs. "Asfar as we can tell, things are coming back up nominally," Caldwell Dysonsaid, adding that the station's U.S, Japanese and European labs are up andrunning. "We've got most of our lab back ? so, to us here on orbit, thingsare looking better than normal." Thespace station is home to six astronauts; three Americans and three Russians. "Itdemonstrates how we can respond in an emergency," Walker said during theinterview with CBS News broadcast on NASA TV. "I think it was really NASAat its finest to get this repair done in short order." Andwhile these types of major repairs could become more complicated following theretirement of NASA's space shuttle fleet, the ability for the groundcontrollers and station astronauts to mobilize and complete such a task in ashort timeframe highlights the strong cooperative effort of those involved, theastronauts said. "Itwas a validation of our teamwork, our training and everyone involved,"Wheelock said. "The way everything came together was a great lesson inteamwork. I think the confidence is real high on the team as we pressforward." Toplan and practice the spacewalks ahead of missions, astronauts rehearse the skillsand maneuvers in the Neutral Buoyancy Laboratory (NBL), a huge underwater tankat Johnson Space Center in Houston. "Ourtraining in the NBL back in Houston is skills-based," Wheelock explained. "And those skills came in very handy. But when you get outside with thetemperature changes and the pure vacuum out there, things don't behave as theydo on Earth. We have to be ready for those things." ForWalker, that meant remaining confident in her expertise at operating thestation's robotic arm. "Justlike with the spacewalk operations, I was trained sort of generically,"Walker said. "With the final EVA, I didn't get the procedures until theday of."? Duringthe first spacewalk, a stuck ammonia hose, and later an ammonia leak, gave Wheelock and Caldwell Dyson sometrouble when it refused to budge. "Ithink the greatest thing that I learned on my earlier EVAs (extravehicularactivities) is just to expect that," Wheelock said. "Just take a deepbreath, think of the different ways that you can finesse the piece of hardware,and listen to what the trainers are telling you on the ground. And don't giveup trying." Forthe spacewalkers, the stubborn hose acted as their nemesis, said Wheelock. "Weneeded a villain to fight against when we were out there," he said. "Butwe were able to rise to the challenge as a team." Theset of three EVAs will likely resonate with Caldwell Dyson, as they were herfirst spacewalks. Amid the demanding tasks, she took time to reflect on thesignificance of the situation, and described the experience as"awe-inspiring." "Thefirst EVA was a culmination of 12 years of training," Caldwell Dyson said. "It was a culmination of so much desire and years of training that it's afeeling I'll never forget. Thestation is slated to keep flying through at least 2020, so spare parts will bea major concern once NASA's space shuttles stop flying next year. NASAcurrently plans to fly two final shuttle missions (in November of this year and February 2011) beforeretiring its three-shuttle fleet for good. The possible addition of a thirdshuttle flight is being discussed by lawmakers.